Off County Road 136 about 5 mi./8 km. 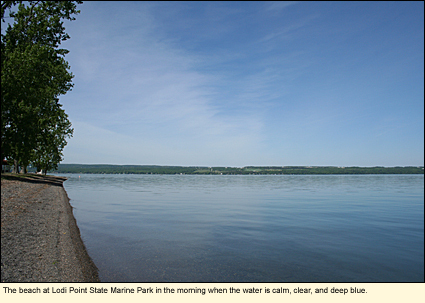 west of the Village of Lodi, Lodi Point State Marine Park is a small, quiet park with one of the most beautiful natural beaches of all the state parks in the Finger Lakes. Typical of points in the Finger Lakes, Lodi Point is shaped like a comma. The beach is clean and covered with small to medium-sized flat stones in a variety of colors, great for stone skipping. 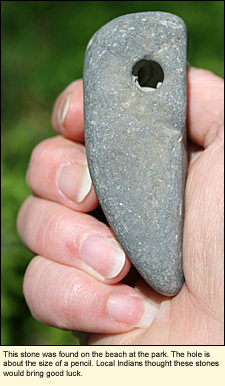 If you look carefully, you will find an occasional stone with a hole in it. These are naturally occuring holes that the local Indians thought brought good luck. Elsewhere on the beach you will find shells, gull feathers, driftwood, and bits of colored glass. Here, the water along the beach is so clear, it almost seems to disappear. In the early morning, the water can be calm and deep blue. From the point, you can see for miles in both a northerly and southerly direction. The park is small and has limited space for wildlife, but birds can be found year round. During the breeding season look for warbling vireos, chipping sparrows, and American robins in the trees and on the ground. During migration look for several species of gulls and a variety of shorebirds on the beach and geese and ducks, and perhaps a loon or two, in the water. Lodi Point State Marine Park has a marina with a hard surface ramp. 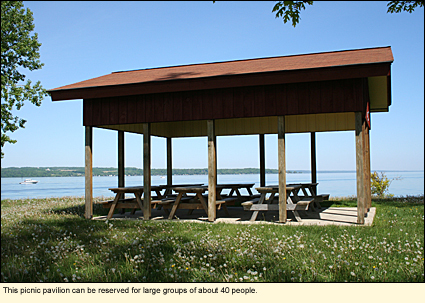 A rustic picnic pavilion looks out over the lake. A new and enlarged playground provides fun for the kids. The parking lot can accommodate 68 vehicles. Open year round. Pets must be leashed.